January is a time when many people make the decision to eat healthier. I personally made that decision in October 2017, and I've lost 50lbs! Now if you are a follower of the blog, you know I'm not eating all healthy 100% of the time, I'm a big believer in enjoying everything in moderation. It's so much easier to eat things that are good for you if they're pleasing to the eye, and have great textures. This Balsamic Chicken Fettuccine from the Taste of Home test kitchen is one of those dishes. I didn't make any changes to the recipe this time, though I will definitely switch to in season fresh tomatoes and broccoli when they are available. I added the mushrooms, but I'm going to admit that I'm not really the biggest fan. I'll also be upfront that my guys would not touch most of this one with a ten foot pole. They are avid veggie haters. The great thing about this is, they'll eat the chicken and the pasta, and I can mix the veggies just into my serving. Thanks so much to Heather and Christie for hosting this event. Be sure to go and check out the links down below to see the other amazing dishes being shared today! You can also join the Facebook group to see what we we are sharing from #OurFamilyTable here. Cook fettuccine according to package directions. Meanwhile, in a large skillet, saute chicken in 1 tablespoon vinaigrette until no longer pink. Remove and keep warm. In the same skillet, saute mushrooms and onion in 1 tablespoon vinaigrette until tender. Add the tomatoes, broccoli, Italian seasoning and remaining vinaigrette; cook 5-6 minutes longer or until heated through. Drain fettuccine. Add fettuccine and chicken to skillet and toss to coat. I'm a huge fan of balsamic! This sounds delicious. We are too, I love it in beef stew and on caprese pasta salad, so many great ways to use it! Great idea for a weeknight dinner! 50 pounds! Congratulations! I love too that you enjoy everything in moderation. This sounds delicious too. As soon as I saw this, I knew I was going to make it. I went over to ToH to get the nutrition info and find that it has 11 WW Smart Points -- so I may even make this tonight! We are all on WW FreeStyle and this is a lower point, yet hearty meal. Thanks! So much flavor in one meal! Balsamic is such a great addition to any recipe. It just elevates all the flavors. 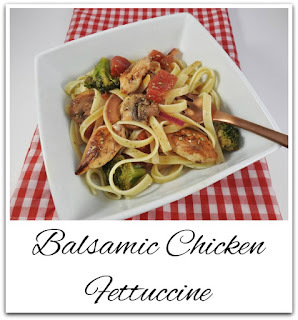 I love balsamic-anything, and who doesn't love a good chicken fettuccine?!? I can't wait to try this! I'll bet this was very flavorful with the balsamic vinaigrette. Healthy comfort foods are the best so meals don't become a chore. Luckily broccoli, mushrooms and tomatoes are on the list of veggies my guys will eat, so I can make the whole dish your way ;-) This looks delicious!